How to Rip and Copy Blu-ray on macOS Sierra With Ease? Most of you are seeking some easy and reliable ways to rip and backup Blu-ray movies on macOS Sierra for some reasons like protect the expensive Blu-ray discs from being scratched or damaged, enjoy the HD Blu-ray movies on ATV, iPhone, iPad and other portable device without a Blu-ray drive. In this tutorial, I’d like share some free and effective way to help you rip and copy Blu-ray on macOS Sierra and previous versions in best quality. MakeMKV+Handbrake combination is an free and feasible way to rip Blu-ray on macOS Sierra. MakeMKV is capable of ripping selected parts of a Blu-ray into an MKV file that can then be used by HandBrake to encode the video into the right format like MP4, MOV for macOS and iOS devices. Step 1. Install and Launch MakeMKV app on Mac, then load your Blu-ray movies to the program. MakeMKV will read and convert Blu-ray movies to the MKV format. Step 2. Open HandBrake app, click “Source” to load the MKV files you’ve generated with MakeMKV, specify the output path and filename, then click the “Start” button to convert. The output format is set as “MP4” by default. Or you can choose Presets bar to select customized settings for your Apple devices. 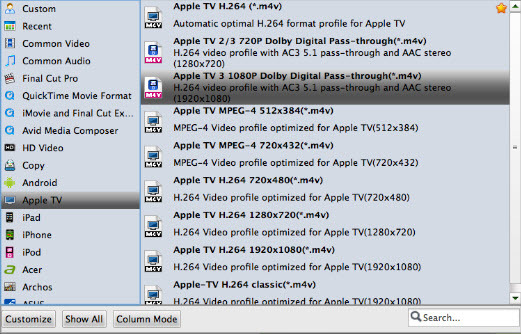 Editor Notes: Twice conversion will cost you 2-3 or more hours, MakeMKV doesn’t do any compression work so you are likely to get a 20-30GB output video, and Handbrake has no ability to remove copy protection from commercial Blu-ray discs, if you are seeking for an easier and quick way to finish the conversion in one time, please turn to Method two. Brorsoft Blu-ray Ripper for Mac is the best macOS (Sierra included) Blu-ray ripper that you’re not allow to miss. It’s capable to remove all Blu-ray copy protection as well as rip Blu-ray to Apple device compatible MOV, M4V, MP4 and more formats in fast speed and excellent quality yet smaller video size. Best of all, it can backup Blu-ray movies with original structure or main movies only on macOS Sierra. For equivalent Windows version, please turn to Brorsoft Blu-ray ripper for Windows. Install and run best macOS Blu-ray ripper, click the “Load Disc” button to load your Blu-ray movies to the program. When the files are loaded, you can select the subtitle and audio track as you like. Click the Format bar, go to the Common Video profile list or Apple device column to pick up a suitable format. Commonly MP4, MOV, M4V is supported by most Apple devices and iTunes. Click the quick button “Copy the entire disc” to start copying the Blu-ray disc to hard drive, including the menus, titles, ads, etc. Click “Format” bar, choose “Copy” > “Directly Copy” from the Format menu and then specify a folder to save the M2TS files from Blu-ray disc. Then you will get the movie without any ads, trailers. With all settings, click the Convert button to rip and copy Blu-ray on macOS Sierra. Once the conversion is done, click on “Open” button to access to the videos you ripped, then you can add them into iTunes library and sync to iPhone, iPad, iPod, ect. Now you’re able to play the converted Blu-ray movies on any Apple device without a Blu-ray drive. Enjoy! And you can also use Video ultimate to rip and convert videos, Blu-ray/DVD or ISO/IFO files on macOS Sierra with ease. This entry was posted in Blu-ray, MAC and tagged best macos blu-ray ripper, copy blu-ray on macos sierra, play blu-ray on apple devices, rip blu-ray on macos sierra. Bookmark the permalink.